As part of our yearly investigation into the materials that are challenged in public libraries in Colorado, our latest Fast Facts delves into detail concerning the format, audience, reason, and resolution of the materials challenges that were reported in the 2014 Public Library Annual Report. Information provided about these challenges help us to gauge the climate of intellectual freedom in Colorado public libraries over time. So how did Colorado libraries fare in 2014? The total number of challenges over the years continues its overall downward trend. This trend has recently leveled out somewhat, however, since the number of challenges decreased by only 3% from 2013 to 2014. Several factors remained consistent from previous years, including the most common audience for challenged materials, adults, which represented the audience for three-quarters (76%) of challenges in 2014. There was also little change in the manner in which challenges were handled by the library; for the majority of challenges, no changes were made at all, meaning that the items were not reclassified, moved, or removed. While “sexually explicit” and “violence” remained two of the most cited reasons for the challenge, “other,” non-categorized reasons continue to rise. An interesting shift taking place is the most common format of challenged materials. In 2014, videos eclipsed books as the most challenged format, at 36% of the total challenges. Book and computer challenges each represented another third (32%) of the challenges. Yet the percent of challenges to books has declined by more than a third (36%) since 2013. The cause of these changes is not clear, but could be related to an increased diversity in the kinds of formats offered by public libraries, and/or changes in how formats are perceived by individuals. Take a look at all of the data and trends from 2014 in the full Colorado Public Libraries Challenges Fast Facts report. … a public librarian, administrator, or other staff interested in getting started using data for savvy and strategic planning? … looking for both inspiration and instruction in a hands-on, participatory environment? 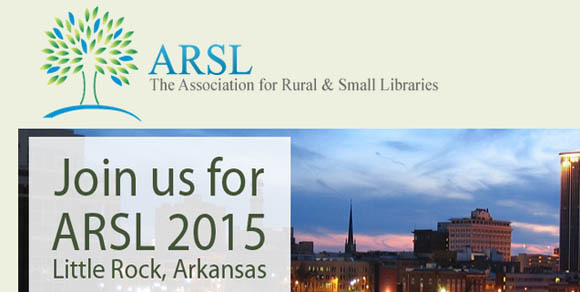 … seeking to learn about outcomes and how to measure library impact? … committed to leading your organization in making data-based decisions? …eager to develop a peer network to support your research and evaluation efforts? 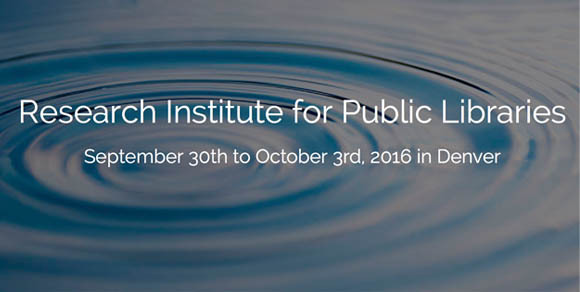 Enrollment opens January 26, 2016 – and only 100 participants will take part in this immersive learning experience. Find out more on the RIPL website. If your organization would like to be a sponsor, please contact Elizabeth Kelsen Huber at the Colorado Library Consortium. Questions about RIPL? Please contact us. Want to connect with others who are interested in public library research and evaluation? Join PL-EVAL, a listserv where you can ask questions, share ideas, and learn from experiences across the field. Pew survey finds that almost a third of Americans are in favor of fewer book shelves, though libraries themselves remain central to communities. Pew Research Center’s new report on the state of America’s libraries declares that libraries are approaching a watershed moment of change. Pew based this conclusion off of two central questions from its survey of 2,004 Americans over the age of 16 – Firstly, what should happen to the books that traditionally populated libraries, and secondly, what should happen to the buildings themselves? It appears that Americans are getting more comfortable with the idea of a library with fewer books. 30% of survey respondents say libraries should “definitely” move books to make way for more space and services, compared to 20% in 2012. 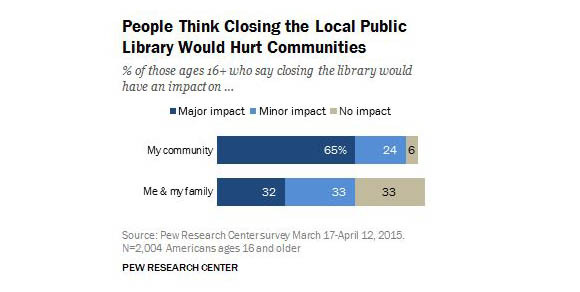 A quarter (25%) said libraries should “definitely not” do this, and 40% were on the fence. However, it appears that Americans are nowhere near ready to forgo the library space as a whole. Nearly two-thirds (64%) thought libraries should definitely still have a physical location. So what does this mean for the future of library books? Public libraries are likely to remain popular community centers and resources for job preparation, but books will also remain a central part of their M.O. Some print book collections may decline, but the formats offered by libraries continue to get increasingly diverse. The Pew survey also found that e-book lending is growing – though the number seems small, 6% of respondents have borrowed an e-book, and 38% are aware that they are offered. Yet even with the growth in popularity of electronic resources (90% of public libraries now have e-lending programs! ), the Pew survey respondents don’t indicate that Americans are ready to go full e-book. Almost half (46%) still aren’t aware of whether or not their library offers e-books. Even more concerning, respondents with the least education and household income reported higher than average declines in library use. This means that despite rapid growth in tech-based services and resources, it will be essential for libraries to continue their quest to close the gap in digital literacy and awareness. 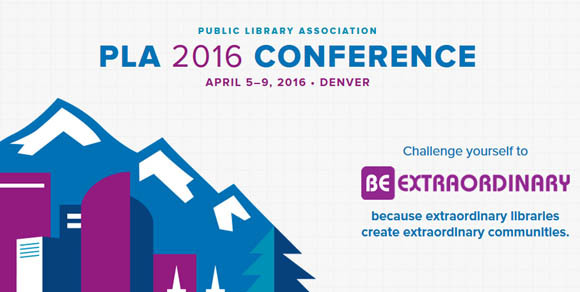 Want to hear more about the state of public libraries? You can access the full Pew report here. You don’t have to be a graphic designer to present your library statistics in a way that effectively communicates value. In this session, straight from the 2015 Research Institute for Public Libraries (RIPL), you will learn quick and easy tips for visually displaying statistics that will enable you to tell a powerful story about your library in your board reports, flyers, displays, and more. The nonprofit early development organization ZERO TO THREE recently released updated State Baby Facts factsheets about the status of infants, toddlers, and families across the country. Early literacy is just one piece of the early childhood education and development picture, so these factsheets are useful tools to help libraries and other early literacy organizations to understand current poverty, health, and early learning data and how their states compare nationally. More than 1 in 4 (21%) Colorado infants and toddlers live at less than 100% of the federal poverty level. One in 10 babies is born preterm, and 9% of babies have low birth weight in Colorado. More than a quarter (27%) of Colorado children younger than 3 experience residential mobility (e.g., multiple moves). Well over half (57%) of parents or family members read to their 0-5-year-old each day. More than 3 in 5 (63%) parents or family members tell stories and sing to their 0-5-year-old each day. At the same time, the cost of infant childcare for Colorado single mothers is nearly half (48%) of their income. Looking for practical tips to make your library more supportive of families with young children? Check out the research-tested SPELL Blueprint model which outlines activities and recommendations from the Supporting Parents in Early Literacy Through Libraries (SPELL) project. Brand-new national public library data is now available from the Institute of Museum and Library Services (IMLS). Fiscal year 2013 data from the annual Public Libraries Survey has just been added to the IMLS Compare Public Libraries and Search for Public Libraries tools. Try out the compare tool to see how your library stacks up to similar libraries across the country based on characteristics you choose. And the search tool is an easy way to pull together staff, budget, services, and collection information for any public library in the U.S.
Data files for FY2013 should be available soon! The Institute of Museum and Library Services (IMLS) recently sent print copies of its Public Libraries in the United States Report for Fiscal Year 2012 to all state libraries. This is the final result of the statistics and data gathered by state libraries into the Public Libraries Survey (PLS), and here in Colorado through the Public Library Annual Report (PLAR) which wrapped up data collection for 2014 earlier this spring. You can check out the Public Libraries in the United States Report for Fiscal Year 12 in full here. And, preliminary data for Colorado’s 2014 PLAR is available now in our interactive tool. Discussions about the digital divide often focus on technology training for adults and career readiness, but as education shifts its focus towards online resources and learning environments, a major concern is the “homework gap” experienced by many school-age children. The “homework gap” refers to the disadvantages faced by children in households that lack access to broadband services. An analysis of this broadband “homework gap” by Pew Research Center reveals that approximately 5 million American households with children do not have broadband access. Even more revealing is the fact that households without broadband are predominately black, Hispanic, and low income. Households with children that have an income below $50,000 are 4 times more likely to lack a high-speed internet connection than those above that income marker, and among low-income households with children, blacks and Hispanics are 10 percentage points less likely to have broadband access at home than their white counterparts. While the FCC’s Lifeline Program is working to revamp their telephone subscription subsidy program so that it would include broadband services, it’s not yet clear how much this would hike up costs and how many of those 5 million households would receive assistance. For the foreseeable future, public libraries are extremely important in helping children and families to close that gap by providing them with access to online educational resources. Providing internet access for school-age children not only affects their ability to get homework done today, but also has bearing on the education and job opportunities available to them in the future. 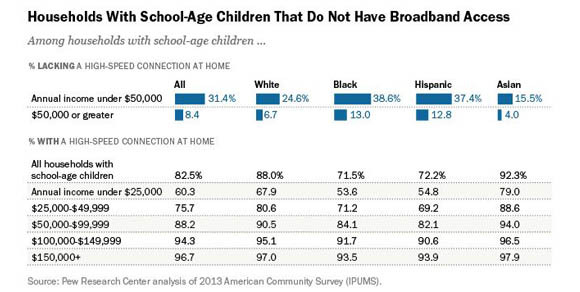 Read the Pew Research Center’s full analysis of the broadband “homework gap” here. We’ve shared the Digital Inclusion Survey with you before, and now new research results dive into data specifically about broadband speeds in public libraries. More than 2,200 public libraries from 49 states reported upload and download speeds at their libraries for wired and Wi-Fi connections. City libraries reported median download speeds of 30 Mbps (wired) and 13 Mbps (Wi-Fi), while rural libraries reported medians of 9 Mbps (wired) and 6 Mbps (Wi-Fi). According to the most recent data, about half (49.8%) of all libraries reported download speeds of more than 10 Mbps, up from just 18% that had achieved those speeds in 2009. The percentage of libraries with the slowest public Internet speeds of 1.5 Mbps or less dropped to 1 in 10 in 2013 from 42.2% in 2009. While the strides being made are exciting, the reality is that just 2% of public libraries meet national benchmarks set by the Federal Communications Commission for minimum speeds serving smaller communities (100 Mbps) and more than 50,000 people (1 Gbps). Technical issues also abound, as might be expected when it comes to Internet connectivity speeds. Captured speeds—both at individual user’s devices and for uploads—lag behind subscribed network speeds. Peak use times meant reduced speeds, particularly for city libraries which saw direct download speeds drop 69% during heavy usage when compared to light usage periods. Read the full report, including additional breakdowns by locale and connection type, here. This broadband discussion is even more timely considering Pew’s recent analysis of Census data about broadband access among households with children and the “homework gap” and what this information might mean for libraries. We’ll bring you more on that research soon.